This approach combines immunobiology and chemistry to detect a biological target (antigen) in tissue using specific antibodies that are typically conjugated with fluorophores for visualization. 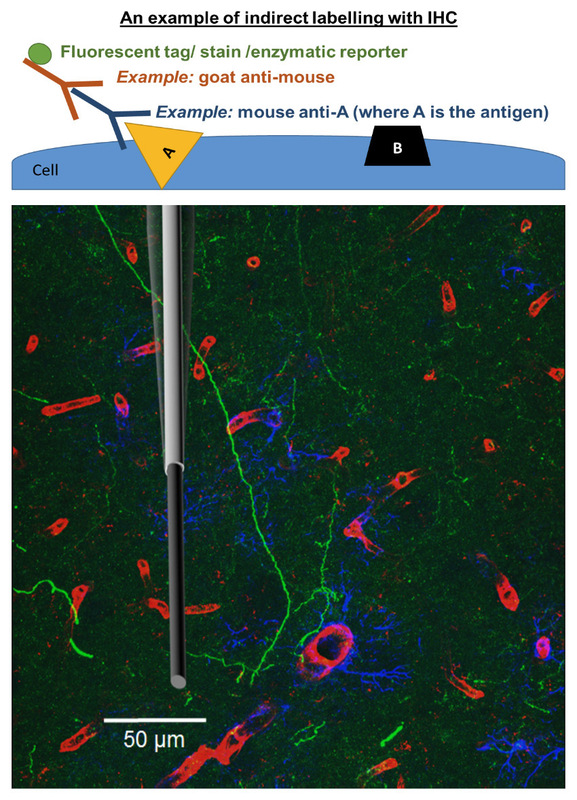 Figure: Immunofluorescent dopaminergic axonal arborization in the striatum of the rat. We have used IHC to triple-label tissue in order to visually demonstrate the proximity of cerebral blood flow through the vasculature (red; blood vessels and microglia) and nearby astrocytes (blue; GFAP label) that are in the dopaminergic terminal recording region (green; tyrosine hydroxylase label). Credit: Sombers lab with Brian Horman and Heather Patisaul. A to scale schematic overlay of a carbon-fiber microelectrode is included to demonstrate the heterogeneous nature of the region.